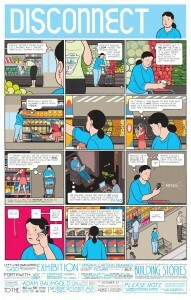 Comic Creator Chris Ware’s “Building Stories” Contains Multitudes in its Brilliant Graphic Narrative : COMICS ARE EVERYWHERE! One of the many mini-comics inside the multi-faceted narrative of Chris Ware's 2012 graphic novel Building Stories. As a gift to myself, I recently broke down and, finally, purchased comic creator Chris Ware’s 2012 magnum opus Building Stories. Upon opening the massive box and peering inside, the book proves to be a lovely gift to any reader who loves the art of storytelling with pictures that transcend the limitations of prose. Comics often thrive in ways that words alone often fail. For anyone familiar with the expanding world of comics and graphic novels, Ware is a master artist whose works go beyond pushing the envelope of the art form. The artist, best known for such works as Jimmy Corrigan, the Smartest Kid in the World and Acme Novelty Library, crafts his fusion of pictures and words with a complexity that stretches the medium to the breaking point where it crosses the threshold into becoming something new and unknown. His graphic narratives are also grounded in the territory of meta fiction where Ware spins heartfelt yarns while simultaneously deconstructing the act of telling stories with the drawings thriving in the panel universe of his comics. Flipping through the collection’s numerous pamphlets, mini comics and newsletters, one becomes aware that the artist’s multi-faceted narrative has no specific beginning. You simply pick one of the publications in Building Stories and start reading, allowing yourself to marvel at the pictures. And the picture stories chronicling the lives of his fictional characters living in an apartment fold in on themselves like a mobius strip of possibilities stemming from the details of everyday life transformed into art. In this respect, Ware’s latest effort unfolds as an epic of multiple narrative threads compressing time and space in the artist’s signature style of tight, carefully designed and meticulously rendered images that speak volumes about our shared human experiences. It’s no surprise that Building Stories appeared on numerous “Best Books of 2012″ lists in the media and for good reason. Needless to say, I was delight to stumble across one of Ware’s appearances on KCRW radio’s literary talk show Bookworm where he discussed his artistic intent with this most unusual graphic novel told in sections. The show’s host Michael Silverblatt is a worthy interviewer who is able to throw an illuminating light on his many subject’s work in ways that comics are all-too-rarely addressed. One of the many complicated and beautifully rendered centerpieces in Chris Ware's critically acclaimed book Building Stories. Anyone who picks up the box set of Building Stories and peers inside to peruse its content knows first hand that the Nebraska-born artist accomplished his mission. The book’s collection of comics disguised as pamphlets, newsletters and other visual stimuli offer a kaleidoscopic view of ordinary people immersed in the act of living, day by day. We are looking at a microcosm of small, fragile lives wrestling with pressure points of unhappiness and uncertainty juxtaposed with moments of grace and beauty without being overly melodramatic.